You’ve heard of Google Ads, right? (formerly called AdWords) But is it right for your small business? I explore the answers to that question including costs, lifetime value, and a brief case study. Everyone wants their website on the first page of Google but using search engine optimization (SEO) to get your site listed for your targeted keywords, while probably a good investment of time and money for most businesses, can be a slow and uncertain process. If you are able to get listed in the top spots, it will not likely happen in a couple days and will usually take 6 months or more to produce traffic that actually makes a difference in your business. This is why advertising in Google is so appealing. You can literally setup your advertising account with Google Ads and have your ad showing in the top spots of Google in a matter of hours. No joke! Google Ads may not work for everyone but I believe everyone should try it to see what type of results you can get. Here are some things to consider when deciding if PPC advertising is a good fit for you. Do you have a good website? All the clicks you gain from advertising will result in clicks to your website (unless you use ‘Call Only’ campaigns). If your website stinks, you probably won’t get good results with Google Ads – or any advertising for that matter. It would be smart to get your website in order first. Check out my post on redesigning a website before starting advertising. How is your marketing? That may sound like a basic question but you’ll want to make sure you have your 3 Ps of marketing in order (Product, Price, Promotion). Hey – I just used something I learned in college! If your marketing is off, you’re not going to be able to sell what you offer anywhere and I can promise you that you’re going to waste money on Google Ads. Make sure your product is unique and valuable, ensure your price is right, and do an excellent job of promoting yourself on your site to make the sale or capture a lead. If these things are in order, then I’d say you’re a prime candidate to dedicate a budget to Google Ads and see what type of results you can get. If after a few months you aren’t getting results, one of the factors above may be hurting you or you’re making common mistakes that I often see in Google Ads. Cost of Google Ads – Too Expensive? Many people are driven away from Google Ads and PPC marketing because it is “too expensive.” Sure – it is a substantial investment for many small businesses, but what would be the cost of your business failing? That would be pretty costly! Google Ads has been the biggest catalyst for the growth of my web design business and it might be the key to growing your business as well. As a business owner, I’m sure you know it takes an investment to make your business grow, and advertising expense is one of the main areas you will need to invest in order to see growth. So how much does Google Ads actually cost? There are no signup or monthly fees for Google Ads. You can sign up for free. You pay only when someone clicks on your ad. Costs per click in Google Search can span a large range. I manage accounts for over 30 clients in different industries and the clicks range from $0.80 to over $10.00 per click with the average being around $2.00. Most people will pay between $1.50 and $4.00 for clicks. Clicks in the Display Network are usually much cheaper but also tend to convert at a lower rate. You can also set your daily budget wherever you’d like in order to manage your monthly spend. So if you wanted to spend $500 in a month (30 days), you can set your daily budget around $16.50. At $16.50/day, you could expect to get about 8 clicks a day if the average cost per click (CPC) ends up being around my $2.00 average. For more info on setting budgets in Google Ads, check out my video on the topic. Can I Setup and Manage Google Ads Myself? Many small business owners setup and manage Google Ads on their own. There’s a simplified version of Google Ads called Adwords Express where you enter in your basic business info and Google starts sending you traffic. It’s super easy to setup but the simplicity comes at a price. I explain some of the downsides of this simplified approach in this video, and to sum it up – you basically lose a lot of control. So I recommend you take the reins of your advertising with a full Google Ads account. This will allow you to choose your exact keywords to target, use advanced bid strategies, and utilizing negative keywords to block the terms you don’t want to show ads for – just to name a few added controls. The caveat is when you start using a full Google Ads account, it opens your account up to a lot of complexity. If you don’t know what you’re doing, you could spend a lot of money with very little to show for it. I’m biased of course since I offer a PPC management service, but I really do think it is worth the money to get a qualified Google Ads manager to setup and manage your account properly. Keep in mind – you may not need professional management forever. Many of my clients move to bi-monthly or quarterly management in order to reduce their total cost but still be able to take advantage of a professional managing their account. Check out this video I created to show the landscape of Google Ads management including pricing and what to expect from reports. I talked about the cost of clicks and monthly budgets above, but what will an actual lead cost in Google Ads. This important number will depend on many factors like your conversion rate and cost per click (CPC), but the cost per lead/acquisition or CPA will be a big factor in determining if Google Ads will work for you. In the video below, I show you the basics of calculating CPA and I show you the average numbers you can expect based on the numbers I see with my Google Ads clients. So as you can see in my video, after over 200,000 clicks for over $600K spent in Google Ads for over 30 clients in different industries, the conversion rate is around 6% and the cost per lead averages out to about $50. Some people will look at these cost per lead (CPA) numbers in Google Ads and scoff at them thinking you could never afford that type of cost per lead. Over the live of my business, I’ve been paying over $100 for a lead for my web design service and my PPC management services. Give it a chance! – Let’s just say you have a cost per lead of $50. In order to get in the right mindset for spending money on Google Ads or any type of advertising, you have to consider the lifetime value of a customer. If you’re in a one-time purchase industry with few repeat customers like selling phone cases for example, the lifetime value of a customer is probably just your profit for the first sale assuming a small percentage of customers come back to buy again. If your profit per sale is less than $50, you might have a hard time sustaining a positive return on investment in Google Ads. 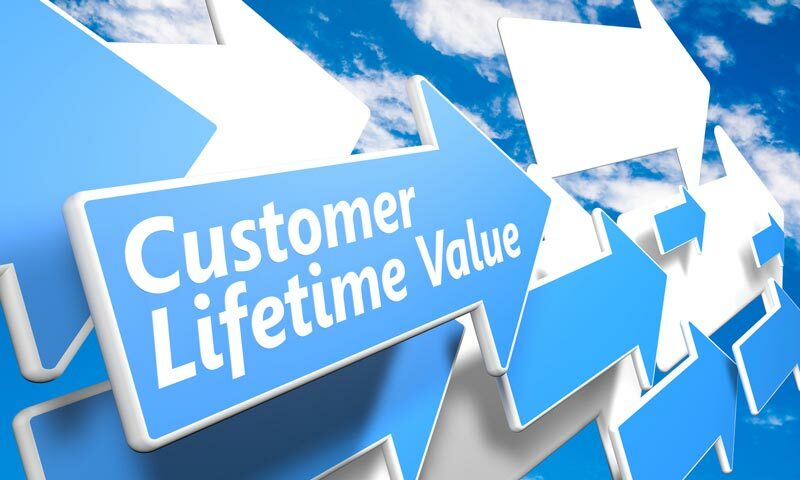 If you have a product or service that produces repeat customers or recurring income, the lifetime value of a customer is much greater compared to one-time purchase customers. Assume my cost for a new client in Google Ads for my web design service is $150 and they pay me $600 for a new website and $29/mo for as long as they remain a hosting and maintenance client. Since my clients stay with me over 2 years on average, after all costs of building the website and advertising, the lifetime value of a new client is at least $850. So would I be willing to pay $150 for average lifetime value of $850 over 2 years. The answer is – all day long! That doesn’t even take into account referrals. I have about 250 paying website clients as I write this and about 70 of those have come from referrals. That means I didn’t pay squat for them but they were referred to me by current clients. This is a major boost to the lifetime value of a customer. Does Google Ads Work For Small Business? In the same way that many people don’t use Google advertising because it’s “too expensive”, many people may also think that Google Ads is mainly used only by Fortune 500 companies with multi-million advertising budgets. It’s true that big companies like eBay, Amazon, and Apple utilize Google Ads, but that doesn’t mean it can’t be used by small businesses to get the small results they need to make a HUGE difference in their business. 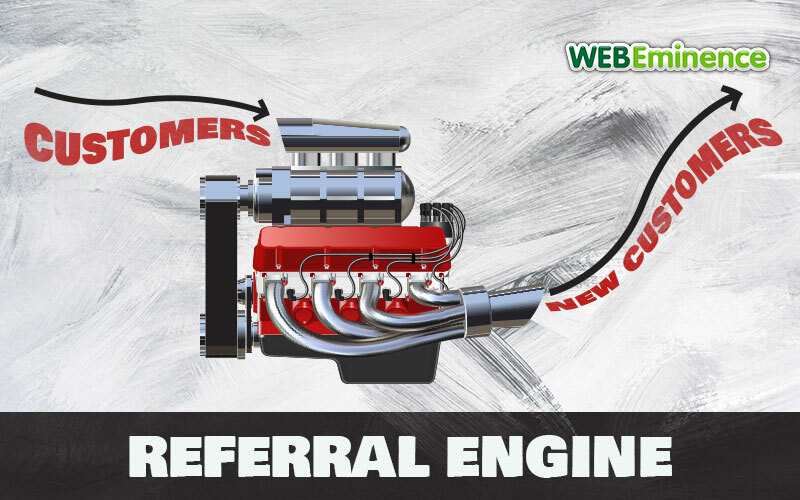 Build a referral machine in the beginning stages of your business. 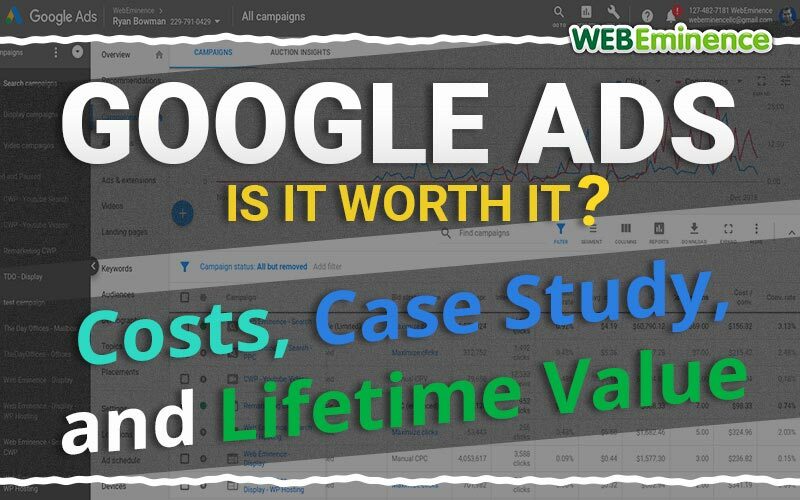 One of my recent clients is a great case study in lifetime value and building a business with Google Ads. We’ll call my client Jon. His business was mold testing in a large metro area in Florida and he started advertising his business in August 2017. He never spent more than $650 in a single month on Google Ads and paid me around $100/mo to manage the account. He had a high conversion rate of over 22% so his cost per conversion was under $30 – solid numbers! So he was getting 15-25 leads per month. He struggled at times with some low quality leads so there was some optimization that had to be done to minimize this. Low quality leads was also just a reality of the business he is in to some extent. The consistent leads turned into consistent work for Jon and his new business. Over time, the work led to exposure that introduced him to other players in the local industry which led to more work and consistent referrals. Now in Dec 2018, only about 16 months after beginning advertising, Jon’s keeping busy enough where he’s thinking he may be able to pause his Google Ads entirely in 2019 or at least slow down his campaigns substantially because he has enough work coming in. That’s where the benefit I mentioned above comes into play – you can start and stop the ads anytime according to work load, budget, etc. My goal with my advertising management service is not to drive clients away necessarily because they get too much work, but this is still a success story for Jon in my book and a testament to how a steady investment in Google Ads during the beginning stages of a business can be a solid foundation for building a business that will last for years and get you past that horrible statistic we all hear about – more than half of small businesses fail in the first 5 years and 20% fail in the first year! Got More Questions About Advertising with Google Ads? I tried to cover all the common questions business owners have in advertising with Google Ads, but what did I miss? What questions do you still have? Comment below and let me know so I can answer all the pertinent questions for everyone reading this!